In the business world, time is money. Because of this, the speed of your software development and delivery is extremely important. To enable speed within your organization, Agile and Lean are currently the best practice frameworks to adopt. However Agile Project Management alone won’t cut it if you don’t excel at your Agile Engineering Practices, providing rapid continuous feedback loops and real-time visibility into important business metrics and values. 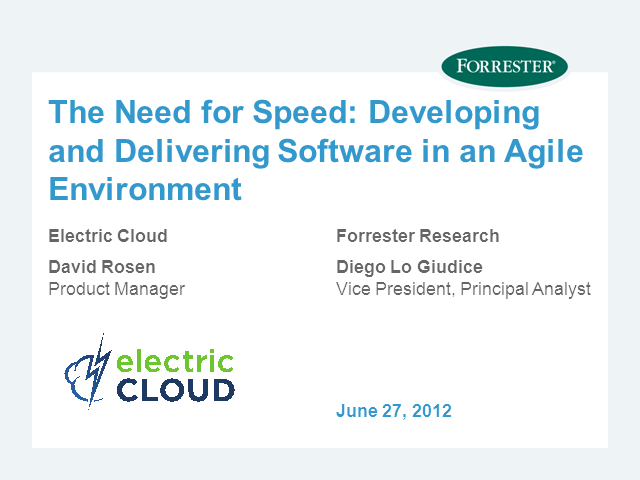 Join this webinar to learn first-hand from featured guest, the independent research firm, Forrester Research, Inc., and the market-leading Agile-enabler, Electric Cloud, on how you can enable the speed you need to develop and deliver software in an Agile Business Environment.